Are you worried about the end of life as we know it? Then don’t just look to the sky for that catastrophic asteroid that could be heading our way. The end may come from right beneath your feet. Super-volcanoes have probably caused more extinctions than asteroids. But until now it has been thought that these giant volcanoes took thousands of years to form — and would remain trapped beneath the earth’s crust for thousands more years — before having much effect on the planet. 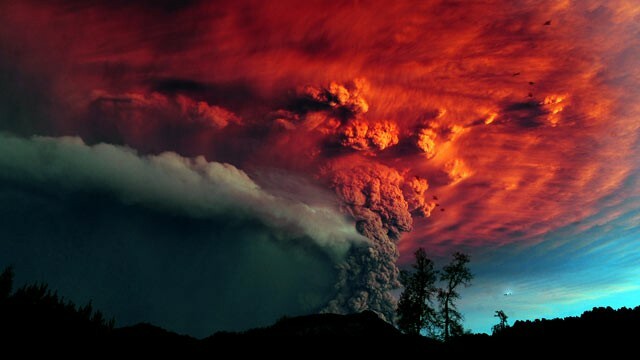 But new research indicates these catastrophic eruptions, possibly thousands of times more powerful than the 1980 eruption of Mount St. Helens, may happen only a few hundred years after the volcanoes form. In other words, they may have a very “short fuse,” according to researchers at Vanderbilt University. Such an event could make thermonuclear war or global warming seem trivial, spewing untold tons of ash into the atmosphere to block sunlight. The result would be many years of frigid temperatures, wiping out millions of species. A super-volcano that erupted 250 million years ago is now believed to have created the greatest mass extinction the world has ever seen, wiping out up to 95 percent of all plant and animal species. Some renegade scientists believe it was a volcano, not an asteroid, that killed off the dinosaurs 65 million years ago. But is global suicide lurking right below our feet? Is a super-volcano about to blow its top? Not as far as scientists can tell. Such a volcano results from the accumulation of a giant pool of lava just a few miles below the ground, and there is no known formation anywhere on the planet that is expected to erupt in the immediate future. Scientists, who could be wrong about that, have thought for decades that once that pool forms, it stays there for thousands of years before erupting. But the new study by geophysicists from Vanderbilt, along with colleagues at the University of Chicago and elsewhere, documents several lines of research showing that the trigger could be pulled quickly, possibly within a few hundred years. “Our study suggests that when these exceptionally large magma pools form they are ephemeral and cannot exist very long without erupting,” Vanderbilt’s Guilherme Gualda said in releasing the study, published in the journal Public Library of Science ONE. That research, as well as earlier research that led to a very different conclusion, was based on the formation of crystals in the molten magma that decay at known rates and thus provide a geological clock, dating various events in the history of the volcano. According to Gualda, previous researchers looked at the decay of zircons, which are common in volcanic rocks, and concluded that the giant magma pools could exist for 100,000 years. But his team looked at the crystallization of quartz, the most abundant mineral in volcanic deposits, and concluded that such a pool would have to erupt in one-tenth of that time, and possibly in only about 500 years. That makes the threat of super-volcanoes a bit more serious, but there’s no reason to panic. Gualda’s team studied deposits in the Long Valley Caldera in northeastern California, where a violent eruption blew 150 cubic miles of molten rock into the atmosphere, blanketing much of North America with hot ash and dropping the earth’s surface more than a mile as it sank into the area once occupied by the magma. That was about 760,000 years ago, but all these years later the region still keeps a lot of scientists on the edge of their seats. The Long Valley geology began misbehaving again in 1978 when a 5.4 earthquake struck six miles southeast of the caldera, suggesting that the volcano might be reasserting itself. In subsequent years that was followed by swarms of small quakes, which are closely associated with pending volcanic eruptions. A couple of decades ago, trees began dying on nearby Mammoth Mountain from large amounts of carbon dioxide seeping from the magma, according to the U.S. Geological Survey. Today, the caldera seems to be quieting down, despite several recent bursts of seismic events, but it is probably the most closely watched volcano on the planet. Scientists with the USGS are keeping a close eye on it, monitoring every little belch, and they insist there is no reason for the folks who live in California to be concerned. At least not yet. Meanwhile, scientists at Oregon State University have been focusing their attention on Yellowstone National Park, where an eruption a couple of million years ago is believed to have been 2,000 times larger than Mount St. Helens. That region also shows constant signs of seismic unrest, and there have been eruptions there several times in the past, according to the Oregon researchers. Incidentally, researchers at Washington State University in Pullman, who have also been studying Yellowstone, concluded earlier this year that the big eruption 2 million years ago wasn’t one blast, but two, separated by about 6,000 years. But just because it was split into two parts doesn’t mean it was benign. The Washington researchers believe the first blast was the biggest, and it darkened the sky with ash from California to the Mississippi River. So super-volcanoes cannot be ignored, and now it seems they can pull the trigger much more quickly than anyone had thought. Let’s face it: at one time or another we’ve all faced a zombie scare we aren’t prepared for. And yes, the local constabulary usually cleans things up with a minimum of fuss, but what happens when things go wrong and the cavalry doesn’t arrive? That, my friends, is the day that Max Brooks’ “The Zombie Survival Guide” saves your life. With several millennia worth of field experience distilled into a manageable 254 pages, everything you need to know to survive the coming war with the undead can be found in these pages. Your life and the lives of those you love are at stake, act now and be prepared! OK, so that paragraph was obviously tongue in cheek, but hopefully in conveys some sense of what Brooks’ remarkable “The Zombie Survival Guide” is like. While obviously a parody of both the horror genre and civil defense/survivalist manuals, it maintains an “all-business” demeanor, never once cracking the façade to reveal the underlying humoristic intent. The result is a book that is, when taken as a whole, a funny, incredibly thorough work of satire. However, at the same time, page-by-page, it is a rather accomplished addition to zombie horror. Starting with zombie physiology and then moving on to weapons, tactics, long-term strategy and history Brooks has produced a manual which has a thoroughness that belies the absurdity of its subject. Point by point he discusses the pros and cons of rifles, machetes and flamethrowers, then considers the optimal defensive positions for various types of outbreaks. After an extensive discussion of survival in a zombie doomsday scenario, he lays out zombie outbreaks through history, and what their implications are. Throughout, entries are extensively cross-referenced and alternative courses of action are always weighed for potential risks and benefits. The remarkable thing about all this is that Brooks has managed to infuse a tension, and urgency into his manual that makes for great reading. Part post-apocalyptic fiction, part “Night of the Living Dead” and part “Saturday Night Live” sketch, this is a book that should hold appeal across a broad range of genres. Thorough without being dry, creepy without being clichéd, and funny without relying on cheap laughs, “The Zombie Survival Guide” is undoubtedly one of the most original books I have ever read, and one that I enjoyed reading immensely. If you appreciate any or all of these genres, or if you just enjoy a well executed, original idea, this is definitely a book you’ll want to check out. And remember…Tomorrow may be too late, read this book today! When Max Brooks, the author of “World War Z” and the ultimate zombie apocalypse guru, walked into the Red Jacket shop, we were all damn excited to see what he wanted to do. We weren’t disappointed in the slightest. Max wanted to build the ultimate civilian zombie gun, and he wanted to make it a Red Jacket. But we had to answer a few questions first. What makes the best apocalypse weapon? What is the one gun that will not only save your life once, but keep you alive in the long run? Do you want the firepower of a military rifle or the simple functionality of a civilian-type rifle? We went back and forth on the argument of tactical versus practical. After a lot of conversation, we decided that we want three things from the gun: availability of ammunition, accuracy and versatility. To meet all these requirements, our mad genius Joe Meaux took a .22 cal. rifle and dropped it into the bullpup platform, added a suppressor, an ambidextrous charging handle and magazine release and an aluminum rail to mount your light or other undead erasing device. The gun he put together is light, silent, easy to use and does the job at close and long ranges — we call it the Red Jacket ZK-22 Bullpup rifle. The bullpup has a match trigger in a barreled receiver which allows the gun to function with a match trigger on both ends. The solid milled trigger bar helps transfer energy perfectly, producing positively no loss in flex. We added a tactical solutions lightweight aluminum barrel, Red Jacket magnum .22 suppressor and a Vortex SPARC red dot scope for good measure. You can even throw in a mounted spike for the hand-to-hand moments in your killing spree. I could go on all day, but I’ll let Joe Meaux tell you all about his new zombie-murdering creation. So the zombies are at your door. Death is upon you, but the gun shop is just a block away. You make a run for it, and you make it to the most extensive armory for miles. Time to make a decision: Which guns do you grab? Contrary to popular belief, not every gun will do the job the same, so to help make up your mind on which guns will save your life, here are my eight best guns for the zombie apocalypse. Without a doubt, the Glock G17 tops the list. It is dead-simple to use, but unusable by the undead. Anyone alive can figure it out — you can train your family on it in ten minutes. It is durable, ubiquitous and it takes perhaps the most common ammunition on the planet: 9mm Parabellum. Magazines hold an ample supply of skull-popping ammo. You do have to keep one thing in mind, though, while scavenging for ammo, magazines and spare parts in an abandoned police station; the G22 is just as common, but the magazines and some internal parts won’t work in your 9mm. Mixing 9mm and 40 cal magazines in your inventory, without proper markings will get your medulla oblongata munched.